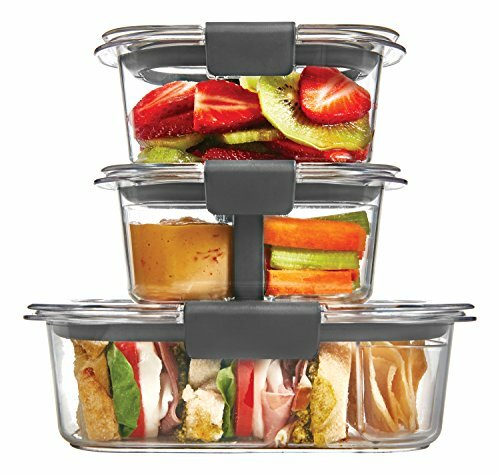 Thanks to its airtight seals and secure latches, this Rubbermaid Brilliance Sandwich/Snack Lunch Storage Container Kit is guaranteed not to leak, allowing mess-free transport of your favorite lunch items—even soups, stews, and sauces. It also sports a modular design that allows convenient stacking in your fridge or lunch bag, saving you some much needed space. No need to unstack and unseal multiple containers to find a specific dish; their crystal-clear Tritan construction lets you see what you've stored at a glance. This material also provides stain and odor resistance to keep the container spotless and fresh after every use. Want an easier way to re-heat leftovers? Built-in vents allow steam to escape so you can microwave food without removing the lid. In addition to being microwave-safe, these Brilliance containers can also be placed in the freezer and the dishwasher without warping or discoloration—but should anything ever go wrong, Rubbermaid Brilliance products are backed by a full lifetime warranty. Set of (3) plastic food storage containers, (4) organization accessories, and (3) lids with a 100% Leak-Proof Guarantee: Airtight seal and secure latches prevent spills and leaks.